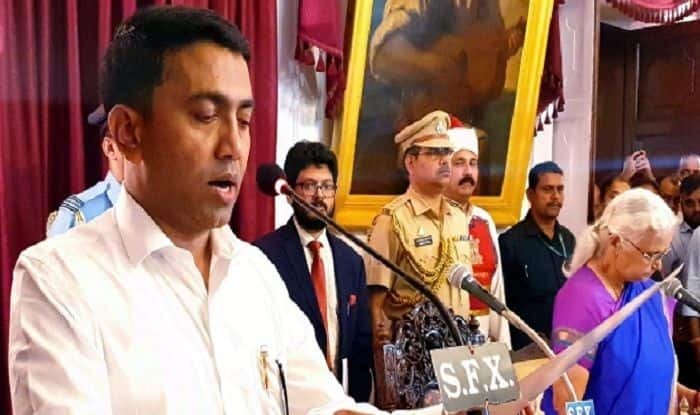 BJP leader and the Goa Assembly speaker Pramod Sawant was sworn in as the 11th Chief Minister of Goa on Tuesday at around 2 AM. New Delhi: A day after speaker Pramod Sawant was sworn in as the 11th chief minister of Goa, the new BJP-led government in the coastal state is set to face the floor test in the state Assembly on Wednesday. Governor Mridula Sinha has convened a special session of the Assembly at 11.30 AM to enable the chief minister to prove his majority in the House. Speaking to reporters, Sawant exuded confidence that the BJP-led alliance would win the floor test and remain intact as the party’s allies are backing him. “I will try to ensure that the alliance remains intact. I will deal with people the way Parrikar used to,” Sawant stated expressing confidence that his government will complete its tenure. He also informed that ministers sworn along with him would be allocated portfolios soon. The 45-year-old took over from former defence minister and four-time CM of Goa Manohar Parrikar who passed away on Sunday after battling pancreatic cancer. Parrikar was cremated at the Miramar beach on Monday. The newly appointed CM asserted that his priority was to complete projects undertaken by his ‘mentor’ Parrikar. “The state government will build a memorial in Parrikar’s name at Panaji’s Miramar beach, where he was cremated”, Sawant added. The government claims majority with the support of 21 MLAs–12 from the BJP, three each of allies Goa Forward Party (GFP) and Maharashtrawadi Gomantak Party (MGP) and three Independents. The Congress, which is the single largest party in the state with 14 MLAs, had also staked claim to form the government. There is also an NCP legislator in the House. Meanwhile, the Congress party in Goa also slammed Governor Sinha and called her an agent of the BJP for giving the saffron party a chance to form the government in the state. “We’re strongly condemning undemocratic action of Goa Governor Mridula Sinha for not allowing our single largest party to form the government and allowing BJP to carry on horse trading despite BJP not having sufficient numbers to form the government,” Congress’s Sunil Kawthankar said. Notably, the strength of the 40-member House has been reduced to 36 following the death of Chief Minister Manohar Parrikar and BJP MLA Francis D’Souza and resignations of two Congress MLAs Subhash Shirodkar and Dayanand Sopte. Earlier on Monday, after multiple postponements, Sawant, 45 was sworn in as chief minister with an unprecedented two deputies past midnight. He was administered the oath of office and secrecy along with 11 other ministers including two Deputy CMs–one from the MGP and another from the GFP. It was for the first time that a tiny state like Goa has two deputy chief ministers. Besides Sawant (CM), Vijai Sardesai and Sudip Dhavalikar (Deputy CMs), the others who were sworn in were –Mauvin Godinho, Vishwajit Rane, Milind Naik and Nilesh Cabral(all BJP), Palekar and Jayesh Salgaonkar(both GFP), Manohar Ajgaonkar(MGP) and Independent MLAs Rohan Khaunte and Govind Gawade.